The Complaint Resolution Process is the exclusive process for resolution of sexual harassment and interpersonal violence allegations filed under the University’s Sexual Harassment & Interpersonal Violence Policy. Allegations cannot be kept confidential if they are reported to the Title IX Coordinator, the Deputy Title IX Coordinators, or any employee with a duty to report these matters. Confidential resources do not have a duty to report details of these allegations and include employees acting in the following capacities: licensed counselors at University Counseling Services, doctors and nurses acting under the direction of doctors at the Student Health & Wellness Center and ordained clergy within Campus Ministry. 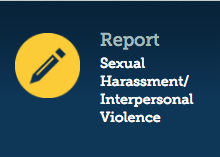 You may report your concerns online to the Title IX Coordinator by clicking on the Report icon to the right.